For somebody who only started skiing in her mid 30s, I have skied in a surprising number of countries: Andorra, France, Switzerland, Austria, Italy and Norway. Each has its own pros and cons. France, for example, is often awash with Brits and ridiculously packed over school holidays but… heeey, tartiflette! Norway is expensive but there is so much snow, and everybody skis really, really well. Italy has the most stylish huts I have ever come across, with gourmet cuisine popping up in utterly unexpected places; and there can be no better place to learn that Soldeu/El Tarter in Andorra with its friendly instructors and jovial camaraderie. But if it is absolutely unashamedly cheesy and fun après ski that you are after, there is no better choice than Austria. But before you assume that this makes Austria the exclusive preserve of drunk twentysomethings, think again. Unlike many people, my first experience of Austrian skiing was not in one of the famous resorts like St Anton or Lech, but in Obertauern, a smaller resort that lies south of Salzburg in the Austrian Alps. The resort has quite a pedigree, starting out as a church and a couple of traveller inns in the 1500s serving people crossing the Tauern mountain pass. The valley welcomed its first skiers in 1920 – and they arrived on foot while their baggage came on horse-drawn sleighs. Citizens of Obertauern pinpoint the founding of the village as taking place on 8 December 1929, because it was on that day that regular winter traffic over the Tauern Pass began for the first time. In 1948, the first lift was installed at the Seekarhaus and up until 1960, the slope was pisted by skiers, who got three free runs in exchange for one hour of piste preparation. Roads and avalanche protection were extended in 1950 and the first button lifts were built, while the construction of the hotel village of Obertauern began in 1952. The first cable car (the Zehnerkar) entered into service in 1961 and the village was officially named Obertauern in 1962. By 1963 the first motorised piste basher in Austria started work in Obertauern and the pistes no longer had to be prepared by the skiers. The village’s main claim to fame came in 1965 when it was used as the location for The Beatles’ iconic film Help! Today, Obertauern is a modern village composed primarily of hotels and other services to support the snow tourism – there is no agriculture or other economic activity and therefore many of the hotels close over the summer. But visit in the winter and the resort is abuzz. All buildings have been built in the vernacular mountain chalet style and so although it is a village filled with tourists, it retains something of the “chocolate box” ambience that ski villages are known for. Shops, ski hire and the local doctor are all clustered along the main street with hotels and apartments set a block or two back. Nightlife centres around RingStrasse with many lively and a few quieter options for dining, dancing and late-night drinking. And what makes Obertauern so popular with its regular visitors (of which there are many!) is the fact that there truly is something for everybody, in terms of nightlife, accommodation and skiing. One of the biggest drawcards of Obertauern is that it is very, very snow-sure, despite not being terribly high (1200-2500 metres). The season kicks off in November and continues all the way through to early May – unheard of in many other resorts. I have been twice for Christmas skiing, often thought to be a bit of a gamble, and both times we had tons of snow. The resort boasts about 100km of pisted slopes, consisting of 61km of blue slopes, 25km of red slopes and 4 km of black slopes. 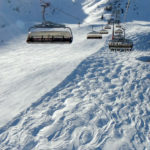 The slopes are served by 1 telecabine, 19 chair lifts (some covered, and with heated seats – bonus!) and 6 rope tows. There are also 26km of cross-country trails available. One of the big drawcards of Obertauern is the Tauernrunde or “Tower Circuit”. Because the lifts are laid out in a circle around the village, it is possible to do a circular route, either clockwise (following the red signs) or anti-clockwise (following the green signs) and to return to your point of original departure. Neither route requires you to be able to ski anything more tricky than a red run and there are numerous mountain huts along the way where you can stop to eat, drink and take in the view. For rank beginners, there are a number of snow sport schools in Obertauern as well as a kiddies ski school with a number of classes based on ability. Happiest of all will probably be intermediate skiers who can happily bomb up and down the numerous red runs all day (my particular favourites are run 5b off the Seekarspitz lift, a roller-coaster of a slope to keep you on your toes; and any of the reds served by the Zehnerkar telecabine). To be fair, technically advanced skiers will probably get a little bored by the end of the week as there are not too many black runs, but the the piste alongside the Gamsleiten 2 lift is the second steepest run in Austria, and when the snow is fresh there are numerous off-piste opportunities beside and between the pistes (almost all of which are above the tree-line). For more tentative black slope skiers (like me! 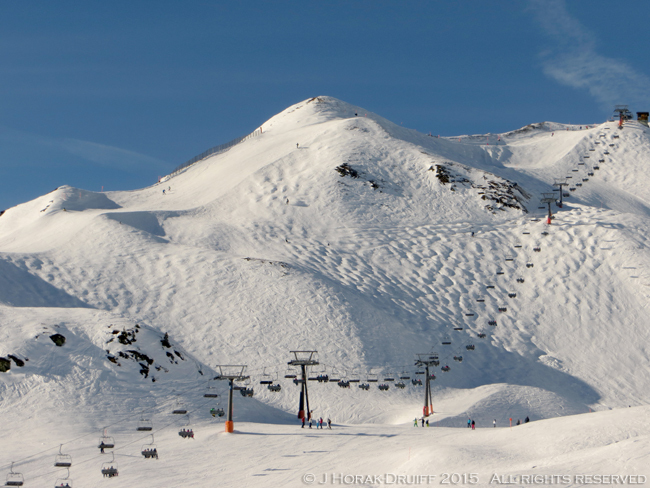 ), the black runs served by the Schaidberg lift are good fun. Slopes are never as crowded as in the French Alps, but my top tip to get away from it all is to wake up early and head over to Seekarspitz and Panorama lifts on the first chair – these are the furthest from the village and you will be guaranteed an hour or so of fresh corduroy before the rest of town is up on their skis. For the 2014/2015 season a 7 day ski pass for the entire area cost €237 in high and €213 in medium season (see the website for details). Any lift passes valid for 1.5 days or longer also include Obertauern’s twice-weekly night skiing. This takes place on a Monday and a Thursday night on the Edelweiss lift from 19h00-22h00. Afterwards, everyone heads for the lively bars at the Luerzer Alm or Latsch’n Alm (and if you leave rather late, like we did you get to ski back to your hotel in near-total darkness!). One word of warning: To get from the bottom of the village (the Zehnerkarbahn end) back to the top (the Gamsleiten end) you need to make sure you catch the last Zehnerkarbahn lift up to ski back across. If you miss the lift, you face a long and unhappy walk in ski boots along the village main road to get back to your hotel (no prizes for guessing who did this!). Obertauern is awash with accommodation, from basic self-catering apartments to comfortable family hotels to luxury spa resort hotels – truly something for everyone. The two luxury hotels are the Hotel Steiner and Hotel Schneider which both boast swimming pools and full spa facilities alongside luxury accommodation and beautiful public areas. Rooms start from about £1,600 for a double room (half board) in January. The hotels I have stayed at are Hotel Solaria and Hotel Austria. The standard of accommodation was similar in both – comfortable and with modest but perfectly adequate facilities: a bar, a sauna, a dining room and plenty of tasty food. Both are family-run (like most of the hotels in Obertauern) and I was struck by how many of the (overwhelmingly German and Austrian) guests visit every Christmas year after year. Solaria probably had the edge in terms of food, with the nightly 4-course menu containing some really tasty and well-plated dishes, and the terribly elegant mother of the owner coming round to each table to greet the guests every night. It was set a little off the main road so it was very quiet at night, and the little bar off the lobby was a friendly place to stop for a drink. The main problem is that it was not properly ski-in, ski-out and that it is at the very quiet end of the village, away from any sort of nightlife. So for my money, the Austria Alpinhotel definitely had the edge in terms of location: it is situated directly on the piste adjacent to the Edelweiss lift and the ski boot room’s door opens about 5 metres from the lift turnstiles! 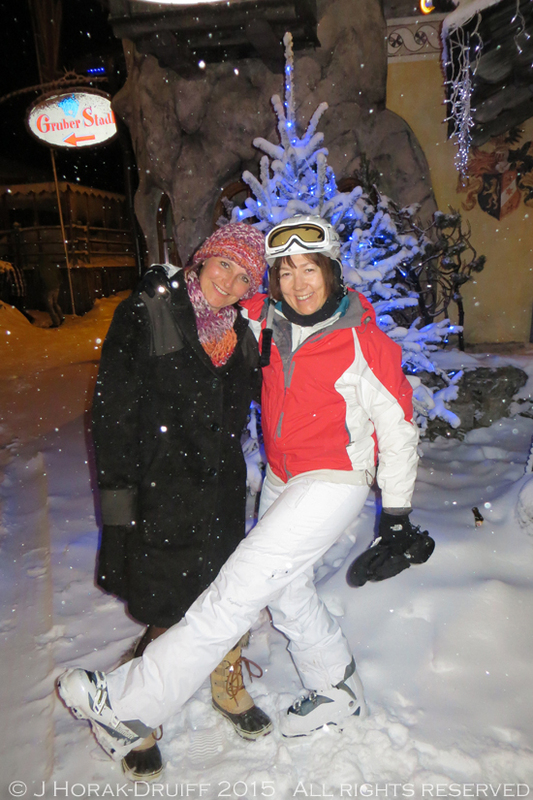 It also meant that night skiing took place conveniently on our doorstep – truly ski in ski out – and it was a short walk up the hill to get to the village bars. Rooms were of a fair size and comfortable with balconies and a panoramic view over the piste and across to the mountains on the other side of the main road. I liked the fact that the cleaning staff took great pleasure in leaving our duvets in different creative shapes each day – you never knew what was going to greet you when you got back from skiing! The food was plentiful and tended towards very traditional Austrian – each night comprised a soup, a salad buffet, a choice of 2 mains and a dessert. Schnitzel, leberkaese and fab Austrian broths with dumplings were most welcome after a long day on the pistes. 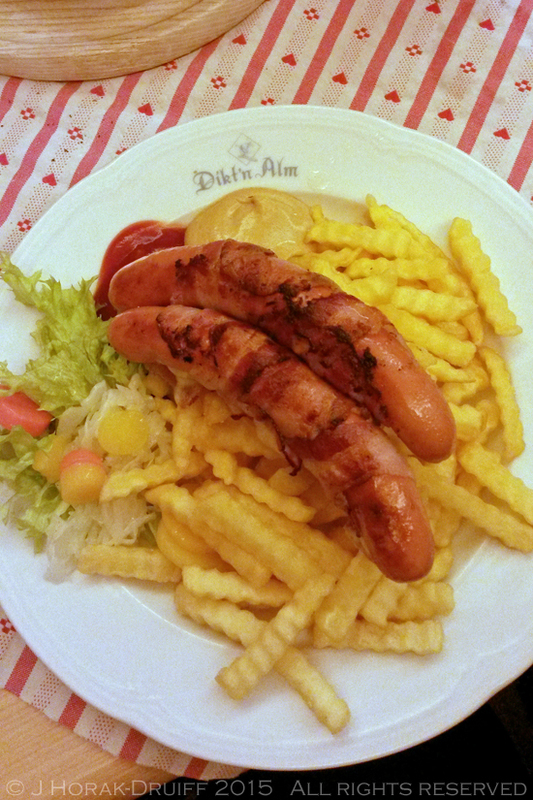 They also do 2 buffets a week – one with an Austrian and one with an Italian theme. We also liked the little round tent bar next to the hotel which provided the perfect spot for an apres ski drink every night. Double rooms cost about £700 for a 7 night half-board stay. Latsch’n Alm is my favourite bar for night skiing apres ski – it’s a bit less hectic than the Lürzer and has a good list of Austrian wines – but you can still get the part started with…erm… a 1-metre Willi: 11 shots of Williams pear schnapps. Those crazy Austrians! My prize for the best loos on the mountain (historically an obstacle course of slippery stairs and wet floors) must go to the Hoch Alm: think sliding doors and Dyson hand dryers. 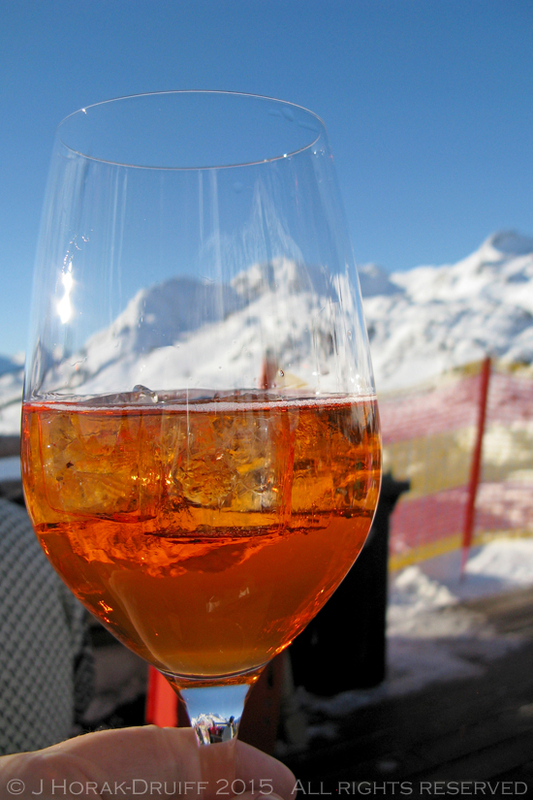 The terrace also has a fantastic view over the frozen lake – perfect for drinks in the sun. The closest airports are either Salzburg or Klagenfurt (both are about 1.5 hours via road transfer) It is also possible to fly into Munich or Innsbruck but the road transfers will take 2h40 and 3 hours respectively. The transfer from Salzburg is done via the Reisen Habersatter shuttle bus service and costs about €55 for a return ticket from Salzburg airport to your hotel. Advance bookings are required and payment can be made online on their website. You could rent a car and drive to Obertauern, but once you arrive in Obertauern it would be surplus to requirements as you walk everywhere, so to me the bus seems like a better alternative. The nearest train station is in Radstadt. For further information, please see the Obertauern tourist office website. When booking hotels during the summer, you will find that many of them show no availability – this is sometimes because the hotels are closed and the owners have not released room availability for the next ski season yet. An e-mail to the hotel requesting your specific dates is probably the best way to get an answer. 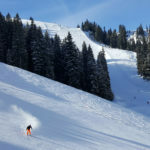 Alternatively, many of the hotels ae listed on sites like Booking.com and there are good deals to be had towards the end of the summer when booking for the following ski season. 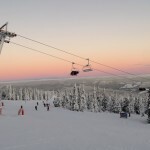 If you enjoyed this post, you may also enjoy my complete guide to skiing in Trysil, Norway; my post on a gourmet skiing weekend in the Dolomites; or my post about Chalet Cateriane, a luxury catered chalet in Chatel, France. I would so love to go back to Austria, and the snow conditions in December sound so much better than where we go in France, not to mention how much cheaper it is. 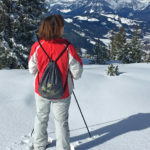 I think when we go on our skiing holidays without the kids, my aim is to go for long weekends to both Austria & Italy and I will definitely come back to re-visit your skiing posts when I do. I am amazed you learned in your 30s, I learned in my 20s but I think you could be rather good on the slopes! What a brilliantly written and organised article, Jeanne. My little family just came back from Les deux Alpes in France and had a brilliant time. I used to go on family skiing hols to resorts in Austria, where this Floridian first learn to ski on snow (I was on a waterski team as a teenager;-)). I will definitely be showing this to my OH and daughter so they can start planning their next trip. Who needs TripAdvisor?! Thanks for putting this together. It looks like a lot of time went in to creating this post. PS My skiing days are over thanks to arthritis and my body basically shutting down in cold weather! Gorgeous and informative post birthday girl ;D Will share! I found so many interesting thing in this blog. So amazing. Being a skier, your experience in snow is awesome. Keep on sharing.